Paul Rice, seen here finishing second overall at YMCA Tri Y in Ormond Beach, Florida is finalizing his training for Ironman Florida 2009. 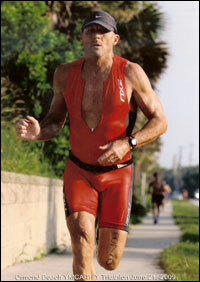 Paul Rice, seen here finishing second overall at YMCA Tri Y in Ormond Beach, Florida on June 21, 2009, is finalizing his training for Ironman Florida 2009, which gets underway on November 7, 2009. At 7:00 a.m., approximately 3000 athletes will begin the race in a mass start on the beach in Panama City, Florida. They will swim a two loop 2.4 mile ocean swim in the Gulf of Mexico followed by a fairly flat 112 mile bike course and finishing with a two loop 26.2 mile marathon run. Given that the days are growing short with the advance of the winter solstice, many athletes don't finish the race until well after dark. Finishing times at last year's race ranged from the overall winner's time of eight hours and seven minutes through the last place finisher in 16 hours and 58 minutes. 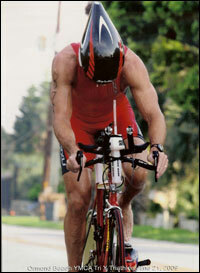 Due to the length and difficulty of an Ironman race, there are many competitors that don't finish.